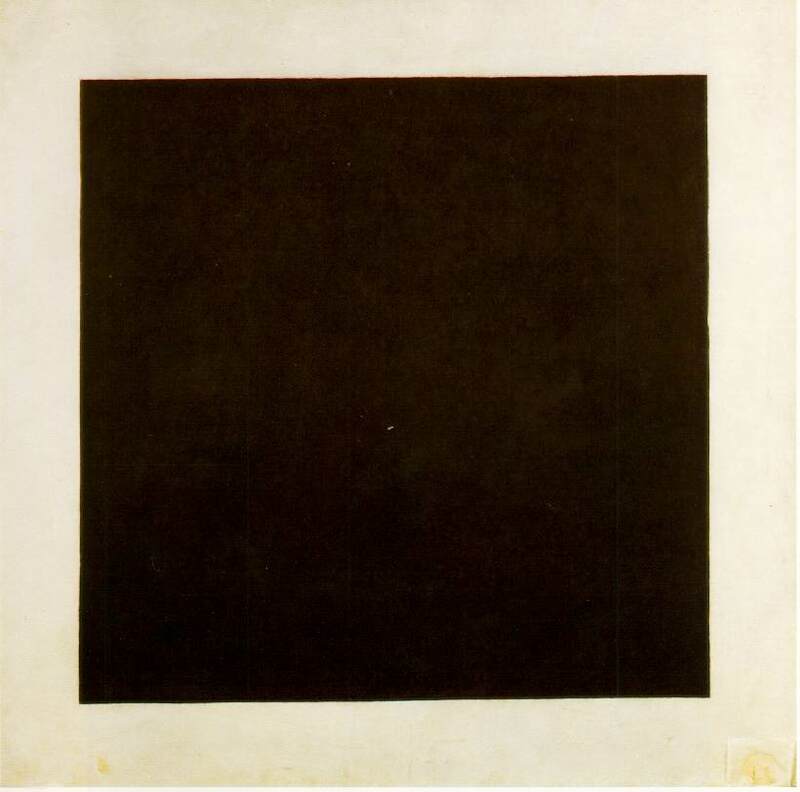 Kazymir Malewicz was the first to call his Black Square an icon. 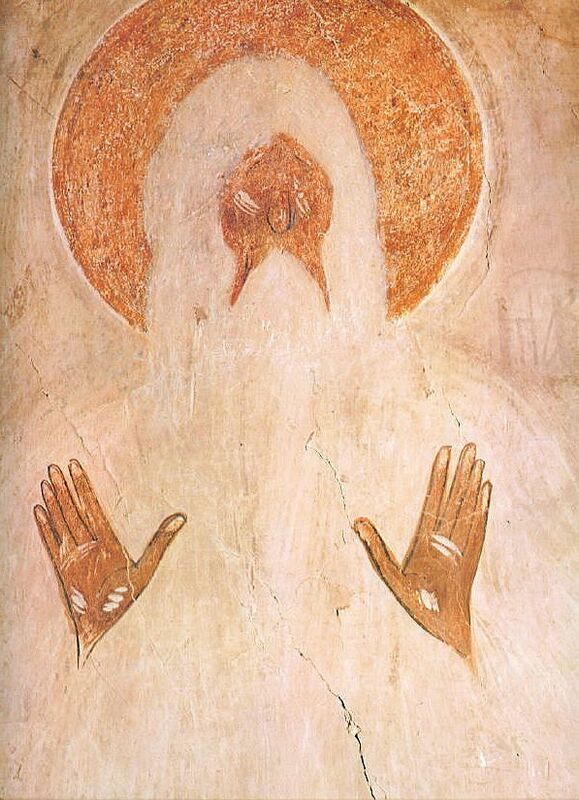 It was his desire, and it was twofold: to create the first icon that was not an icon - an abstract item, free of sacredness and of any theological content - and at the same time to open it towards a supreme realm of new sanctity. This is the heart of the matter, once it is acknowledged that "Art does not need us, and it never needed us, not since stars first shone in the sky." Here is the core of the idea which is despised these days: an Art not constituted by the Humane. How many artists today set a goal for themselves to live by their ideal of Art in the face of eternity? Eternity, rather than the community... Very few. And those who confess that this indeed is their goal are regarded as old-fashioned or esoteric at best, and as arrogant sociopaths in the worst case. But how wonderful is Malewicz’s insight: "ever since stars first shone in the sky," he says, Art has had no need for us. Ever since when? Already there were the lands. And there was grass, and gardens, and then, on the fourth day, the lights were set in the firmament. Since that time; nothing less. From the very beginning Art did not need us. Art means the supremacy of pure feeling. This is to confront the very fact - thus Malewicz - that the trait of sensibility is its being a non-object. This is the essence of Black Square, and also the essence of Malewicz’s thinking in general, including the Malewicz of the late colorful peasant paintings. Many say he had betrayed himself after the revolution. The truth is to the contrary: subject matter, content, object - anything that is representational - was and has remained for him the 'killer' of art. Art - either abstract or figurative, without any difference - is being newly murdered whenever the only meaning a "World" can have in Art is bypassed: when a Form is true, it is a World unto itself. The non-objectness of Black Square harped on its sharp, thin, delicate sound, against the blunt opaqueness typifying the philosophical threshold of a retinal culture, and not necessarily against figuration as such, as many tended to think. A "World" in Art is founded on the faculty to invent Forms which carry true authority. This authority, the being a World of a Form, comes from the Form itself - the Form is a materialization, indeed a coming into being of measure. For to be able to consider the disaster created by the historical retinal culture, the faculty of measure is indeed required, but it is the excitement, the love of truth, the pure feeling where the very possibility of this black painting had come from. It crystallized the insight that measures are not transparent; nothing can be seen through the Black Square. That is, an artistic sensibility - the power to discern a true Form from a false one - is not of a mimetic or re-presentational character; it has no referent, it points nowhere outside itself. Thus, and despite the best of intentions, much jabber is produced whenever the sense and meaning of the Forms of Art is believed to be found in a process by which art it taken backwards, so to speak, in an attempt to establish a supposed Pre- to a given Representation, thus harnessing Art to the daily reality of the world. Before and also after Malewicz, and these days too, most art critics have interpreted Art in this fashion. They try to make sense of the Forms of Art by filtering them through the historical, sociological, psychological, national, or biographical dimension, in the illusion that this type of scanning/screening will also establish them with validity; make their measure be seen. We have been hearing about this fundamental modern consciousness concerning the murderousness of the optic nerve for more than a hundred and fifty years now. It is always actual, always a burning issue. So few among artists and the art crowd have truly taken in this timeless, ageless idea. But all great minds, Malewicz among them, have felt and expressed it in various ways. They all understood that the imagination, the psyche, the feeling, are all bankrupt once one insists on understanding them to be categories of input-output (the artist as a spectator). Malewicz’s Black Square is the ultimate rebellion against this terror, under which Art is made foolish, generation after generation, and always in the hands of Art lovers! How to concuss the connoisseur, once and for all, make a painting with No Thing, about Nothing... entirely incomprehensible, yet open to Everything? Malewicz had done it. In point of truth, there is only one ready-made, and also only one abstract painting. 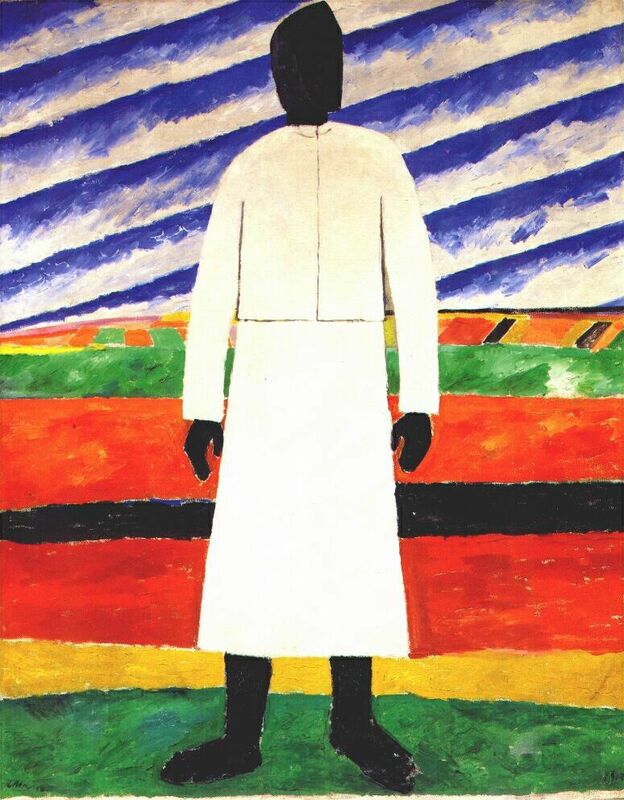 First there was Suprematism, a rather mediocre philosophy of color, and then - after a long pregnancy - came the thing, when Malewicz flooded his Worlds with so many brilliant pigments, the dazzling paintings of peasants and babushkas. Neither the revolution, nor any ideology, have ever shaken me with beauty and freedom greater than these total canvases, religiously conceived and born from Black Square. Apropos freedom: Malewicz, that theoretician, extremist, and non-conformist, happened to love Rubens very much... For those among you who do not know this. The faculty to mark this - an edge - pointing so energetically and quietly to the very abstractness of Measure - this very particular matter requires enormous feeling. The entire process - from Black Square to the peasant paintings, and from them back to the Square - reveals the amazing powers Malewicz had had, and the determination of his analytical faculty. Is it possible, for instance, to imagine Piet Mondrian "returning" to figuration? I reckon not. Given the rigor of Black Square, as well as the immense boundaries breached by this artistic project - "since stars first shone" - it is of interest to listen to what Malewicz had to say about his modernist predecessors, who have similarly resisted the tyranny of the optic nerve. For instance, what did he think of Cézanne? He thought that Cézanne was absolutely necessary, albeit provincial. And of Cubism, which had deeply influenced him and his friends in Moscow and in Petrograd, he thought that its worth was in the very little that could be offered by a dialectic method. Therefore, according to Malewicz, neither Cézanne nor the Cubists introduced anything of interest with regards to the idea of a work of art’s true value. For him, the story of art could not be met with an account of tactics; conventions versus contra-conventions. To me, personally, it seems dull to bundle Cézanne together with the Cubists, but the art groups Malewicz was in contact with in Moscow had received it that way. The point, however, of his critique pertained to his notion of absoluteness and of the eternal. "... and it never needed us since stars first shone in the sky." There is a discourse, a useless one, I think, about a presumably actual contemporary Malewicz, the father of the logo, the etiquette, the label. One can try to press the point, but to my mind Malewicz in no way populates any branch of design and commerce. Neither does the Malewicz of the Standard and the Architecton. He is an important and a very big prophet, but he is not the prophet of the present 'smart' city. 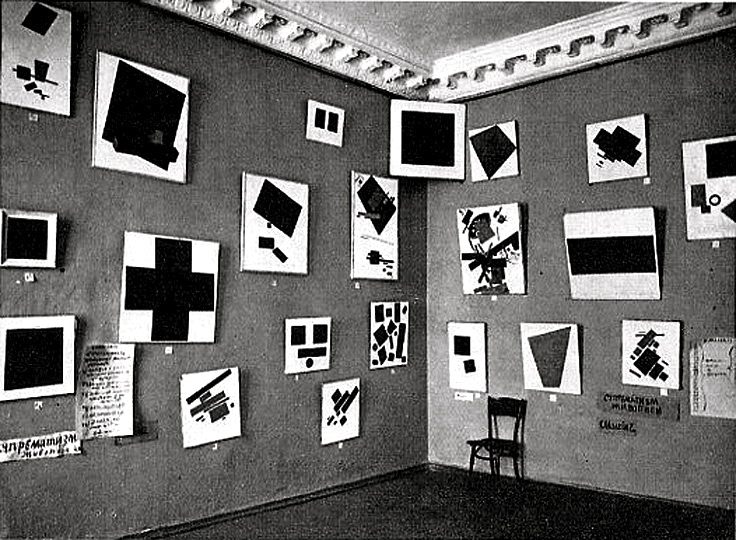 Black Square was hung below the ceiling, in the corner of the showroom of the first Suprematist exhibition (0.10 Exhibition, 1915, Petrograd), like a sovereign to all else hanging underneath. The placement of Black Square was similar to that of the icon - the house saint - in the traditional Russian orthodox home. Malewicz chose this location because "Art does not need us, and it never needed us since stars first shone in the sky."